A few years ago I was searching for jobs on my local equivalent of Craigslist. I saw a post in the ‘work wanted’ thread with the heading “Need to Make $300 Fast – Will Consider Anything”. Of course, that drew my attention. The OP said that they needed to make extra cash by Sunday or they’d be evicted and they’d consider anything. To this day I still think of that post and hope the woman found a way out of her troubles that didn’t involve less salubrious methods. If you’re in a situation where you need to make money fast, I hope this list can be of some assistance. Two surveys that pay you fast are Vindale and Survey Junkie. Vindale claims to offer up to $70 per survey and I’ve known people to get $50 Surveys on Survey Junkie. Sign up to Vindale here and Survey Junkie here to start making money right away. Plus, more ideas here. Call Labor Hire agencies for night fill or inventory counting jobs. Often these types of casual one-off jobs are filled at the last minute so you might get lucky. Depending on your skill set and certifications you might be able to find other casual work that starts immediately, like babysitting, house sitting, bar work or many other tasks. For more ongoing work, check out this list of part time job ideas. Your home is full of valuable items (and probably a lot of junk too, if you’re human like the rest of us). For a list of profitable items, you can flip when you need to make money fast check out this link. If you’ve got a week up your sleeve, you can become an Uber driver for spare cash. Driving for Uber requires you to own a modern car, and there are some other requirements, check out this post for more info. If you’re a native English speaker and have a college degree, you could earn between $14-$25 per hour, teaching English to kids in China with VIPkid. Learn more about VIPKid here. Focus groups and research panels are easy ways to make money fast. I’ve made up to $100 per session and often light refreshments are provided. To find your nearest focus group google ‘your city’ + ‘focus groups’ or ‘your city’ + ‘market research’. So erm, yeah. Sperm is money. If you are blessed with healthy sperm, and you have no major health conditions, donating your sperm can be a lucrative way to make money fast. There are a few things to think about first, so have a read of this great piece before you pursue this cash-cow. If you live in or near to Venice, Santa Monica, Westwood, San Francisco, Palo Alto, Pacific Beach, San Jose, San Diego, Washington D.C, Austin or Dallas you could get paid to charge Birds. Birds are personal electric vehicles (think adult-scooter on crack) distributed via a transport sharing network. Your job is simply to pick up Birds (ha!) in your neighbourhood, take them home, charge them and release them the next day. Learn more about Birds here. If you have a unique health condition, you may be eligible to earn money for taking part in a research study. Participation does require commitment over time, however, the chance to make extra money whilst having a positive impact on others is a win-win. Have a read of this article for more tips. Upwork is how I made extra money freelancing before my blog was earning an income. I’d pick Upwork gigs as the easiest way to make $300 fast, especially if you have a specialist background or experience in digital marketing. Click here to read how I got started with Upwork and made $175 for just one article! 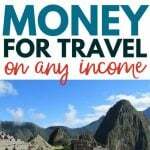 There are plenty of other ideas to make money from home in this article. For more ways to make extra money, check out my monster post on making money online. For money-saving tips, check out this list of frugal living tips to slash your expenses today.